Glow Daily Vitamin C gel cream by REN will brighten lacklustre complexions, and enhance your natural radiance to release your inner glow : the secret for your daily custom glow ! Combined with super-hydrating and illuminating magnesium, to nourish and replenish, and plants and fruit extracts, vitamin C protects the skin against major skin-damagers like pollution. REN Radiance face cream helps get smoother - fine lines and wrinkles are reduced -, brighter - hyperpigmentation and dark spots are reduced -, and refined skin. Vitamin C without redness for sensitive skin too : this glow-giving face moisturiser gentle formula is irritation free, and friendly to all skin types and skin tones. Now even sensitive skins can get their glow. Fresh and naturally citrus scented, REN face moisturizer with Vitamin C melts into skin, for an easily-absorbed hydration fix, leaving no residue, so it’s perfect for breakout-prone skin, and will also help lighten any scarring, too. Natural radiance face cream for all skin types. 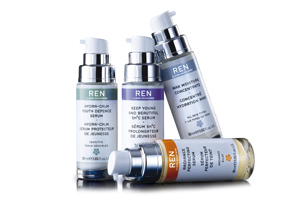 Exfoliate the skin with REN Ready Steady Glow Daily AHA Tonic. Combine once a week with REN Glycol Lactic Radiance Renewal Mask.